Walk into any office, the dedicated employees will be jabbering away with USB headsets on. While the bosses prefer Bluetooth headsets, most of us revel in the freedom of leaving behind our office headsets as we take a break near the cooler. You end up using office headset for hours every day. You need the mic for taking Skype, Lync or VoIP calls. You need the inline controls for quick muting and talking. Above all you need comfort from the one object which perches persistently on your headset. An uncomfortable headset will fast unravel an employee’s productivity over the day, especially in a call center. We selected the 10 best USB headsets for office use which will boost comfort and keep you sharp in a conference. You will always get the punch line with these on. What are the advantages of USB headsets over analog headsets (3.5mm)? To understand this, you must first know the difference between USB headsets and normal headsets. Their differences run deeper than just the plugs they go into. The headphones with 3.5mm jack depend on the onboard soundcard of the PC /laptop for audio conversion and generation. The sound card houses a DAC/ADC and an amp. The DAC processes the sound that leaves the PC. The ADC processes the analog signal received from avenues like microphones. An amplifier amplifies the analog signals so that the audio reaching your ear pieces is loud enough. Sound Card: If the sound card of your PC is busted, the USB headset brings you a reprieve. Without having to upgrade your system, you can bypass the faulty sound card and get clear audio from the USB headset itself. Your 3.5mm headphones will sound dead or disturbed if the onboard sound card doesn’t work right. Interference: This is not a huge factor but it’s seen that the onboard soundcard faces electromagnetic interference from other elements on the motherboard. This could result in a light hissing noise at the background. In a USB headset, this sound card is isolated. So there’s lesser chance of electromagnetic interference. Crosstalk: Sometimes, the analog signals to a 3.5mm headphone are hindered by crosstalk and analog signals are susceptible to it. Since USB headsets deal only in digital signals, they are not hampered by crosstalk. USB port: Most people see it as a disadvantage that USB headsets take up one of the USB slots. But as people who listen to music while working, we appreciate that it leaves the 3.5mm port open for true audiophile headphones. We can hardly use the office headsets for listening to music! Microphone: Most headphones focus more on their audio and less on the microphone quality. But many USB headsets are customized to perform optimally with office software like Lync, Skype, speech recognition software or other conferencing platforms. They provide good inline control buttons too. How to setup a USB headset for office? Usually, USB headsets can be used with a few moments of automatic setup. But people often run into setup issues. With most office headsets, you can plug them in and the PC/laptop will automatically recognize and configure them. Once done, a small notification message will be displayed at the bottom right corner. If it’s not recognized, try unplugging and plugging it in again. If your USB headset came with a setup CD, it might not be automatically configured. You might even get an error when the headset is connected. Run the program on the CD and let the installation process take its course. Some modern USB headsets do not come with a CD upon purchase. Rather the manufacturer puts the updated software driver on their website. You can download it and run the headset. If USB is connected but the audio still plays on the laptop speaker, right click on the Speaker icon in the tray(Windows). Choose ‘Playback devices’ and right click on the USB headset and pick ‘Set as default device’. Click the ‘Recording’ tab. Right click on your USB device and select ‘Set as Default device’ for mic to work. 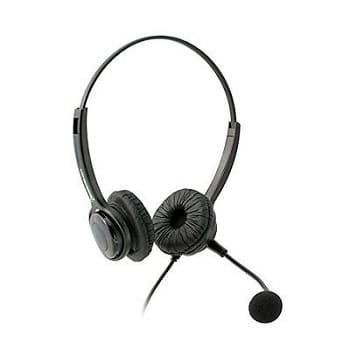 Click Apply and OK.
What are the key features of high quality USB headsets for office? Audio: It’s very important that you hear the vocals on the USB headsets clearly. In an online meeting, you should hear the spoken words clearly. In a status call, if all you hear is your boss mumbling, then it could be the headset’s fault. The best USB headsets covered here have midrange-focused sound signature that doesn’t sound boomy or sibilant. Mic: Microphone is an important accessory in an office setup. Your suggestions and ideas need to be heard. A faulty headset should not cost you recognition or progress at work. The best USB headsets for office selected here have noise-cancelling mics that pick up speech clearly. Nearly all of them can be used with speech recognition software also. Comfort: Since you will be wearing the office headsets for long hours continuously, we have selected comfortable units. Most of them are one-ear headsets. But they sit lightly on the head without much headband pressure or uneasiness on ears. Budget: We judged the headsets on value for money. You may come with different budgets but you all want good value for your money. So the best USB headsets for office selected here vary across a wide price range, but they are all worth their price or more. Features: Extra features like dedicated Skype call buttons on inline mic, mute button, Noise-cancellation on mic etc. earned the best office USB headsets points in our books. Plantronics C325-M USB headset is as comfy as the ergonomic chair at work. These are handy enough to be carried back and forth from work every day. They are built to be comfortable for longs hours of continuous use. The mic functionality is optimized for work and conference environment. 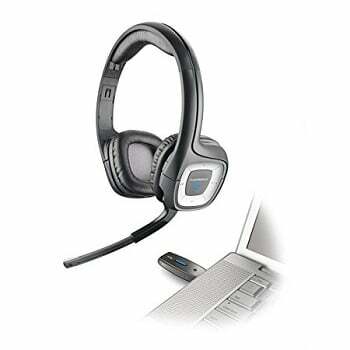 This is a dependable headset coming from Plantronics which commands trust for office communication devices. 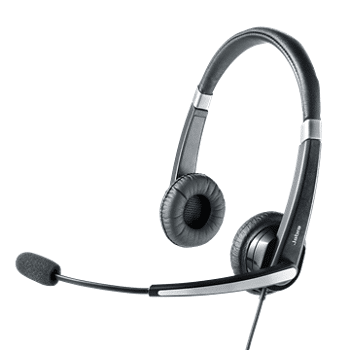 C325 set needs no help to scale the top of the best USB headsets for office list. The Plantronics C325-M USB headset features a sleek headband which connects to two on-ear ear pieces. The headband clamps very lightly on the head and exerts minimum weight. The arms are foldable for portability. The earcups have moderate padding. It’s not so much that your ears will sweat but it’s enough to offset the light weight of the headset. The ear cushions are sheathed with leatherette that feel soft to the ears. The back of the ear pieces has vents in the pattern of spokes. We suppose these contribute towards keeping your ears airy and cool. We would still suggest that you take them off every couple of hours. The mic is mounted on a rotating boom which retracts out of the way when not needed. This office headset’s cable ends in a 3.5mm jack. An extra cable which begins at an inline control and ends in a USB jack has been included. This allows you the luxury of using it either with the headphone port or the USB port. It is a single-sided cable which gives you better mobility over cable connecting to both ear pieces. The joint has been reinforced by colored plastic tubing. Apart from the volume navigation and mute button, you also have a Skype call button for quick access to the calling option on the inline control. The audio quality of Plantronics C325-M USB headset is good enough for music. Usually office headsets are just good at relaying vocals clearly, but the C-325 goes above and beyond that level. The audio is excellent for office use, with calls played out like all the participants are right next to you. The mic works persistently to remove noise from the calls. Many people have reported how much clearer they sound to others on the call. This is one of the best office headsets for speech recognition and training with tools like Dragon NaturallySpeaking etc.. The mic does not have mic monitoring though. This feature is used to feed a part of your voice back to you so that you can judge how loud you are. 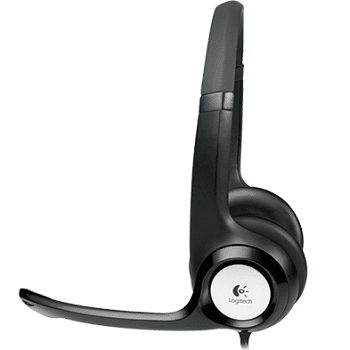 The Logitech ClearChat Comfort H390 USB headset for office is a popular unit amongst the white-collared folk. It looks so different and more polished than the usually rickety office headsets. The build is more substantial but very lightweight. The controls are innovatively placed. The mic and ear pieces have some nice adjustable settings. Logitech ClearChat takes a bold step forward in the headset design. It was a no-brainer for our best USB headsets for office list. 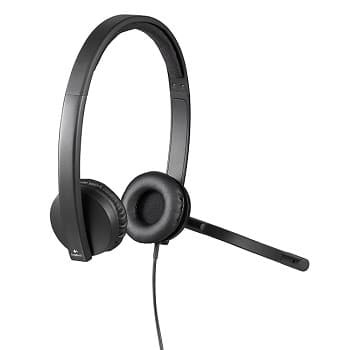 The Logitech ClearChat Comfort H390 USB headset for office is a unit built for comfort. It is built more substantially than the usual USB headsets. The headband is broader. The ear pieces are fit with plush on-ear cushions sheathed in synthetic leather. The headband is also padded lightly. But H390 is also constructed to fit small or medium-sized heads better. The ear pieces can swivel in their cups and conform to your ears better. It is light but not as much as the Plantronics C325. The microphone of this office headset rotates out in only one direction. So you can swap the ear pieces. The joint of the mic arm also moves backward to pull the mic closer to the mouth. The cable is connected to the left ear via a sturdy joint. It is 8 feet long and terminates in a USB jack with long plastic housing. The inline control is circular. The rims of the button can be used for volume up/down. The central button itself is for muting. Once muted it switches on an LED to show the Mute status. The Logitech ClearChat Comfort H390 USB headset for office performs way better than its price demands. You can easily discern the details in voices from other end. So this can double as a gaming headset as well. Being a USB headset it eliminates any chances of static during emergency orders from the team leader too. It might not be too great for music. But a casual listener can use it for music if need be. The mic of this office headset is quite sensitive to the vocal sounds. People have successfully used this with speaking and pronunciation software. The mistakes in your pronunciation become immediately apparent to the tool with the H390. The noise-cancelling function removes the background noise while you are speaking. Jabra UC Voice 750 MS Duo USB headset for office is a spiffy-looking unit. The ribbed design on the headband and mic makes it stand out from the crowd. The comfort of the headset is a hit-or-miss based on your head size. The cable is a sturdy affair and a classy inline control rests in between. Both the incoming and outgoing audio have the clarity we expect from Jabra in office communication devices. UC Voice brings a breath of fresh air to the best USB headsets for office list. The Jabra UC Voice 750 MS Duo is a good-looking office headset. The headband is cushioned in the cranial region. The joints where it extends is done in metallic finish. The rest of the band has a ribbed design that gives 750 its distinctive look. The on-ear ear cushions are moderately thick. They were largely voted to be comfortable. But it ultimately depends on your head shape and size. The headset is lightweight and also folds at the arms. This reduces the footprint down to half, making it quite portable. The mic of this USB headset is mounted on a rotatable arm which extends into a flexible boom. This allows you to rotate the mic out of the way after use and also move it closer or away from the mouth. The mic arm also carries the ribbed pattern. The cable connects to the left ear piece. It is 7 feet long and ends in a USB plug with moderately large housing. The inline control is built to tactile advantage. It has four buttons, one each for volume up/down, mute and Lync call. 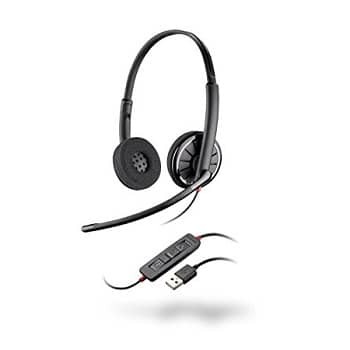 Jabra US Voice 750 MS USB headset for office invests equally well in both design and audio. The audio quality is excellent. It is suited for both vocals and music. The 750 MS Duo is equipped with Peak Stop technology. It curtails the volume so that you aren’t suddenly surprised by loud noises and protects your hearing. The mic is noise-cancelling so it filters out background noise and projects your voice to the caller. It is perfect for the noisy, open corridors of your workplace. Logitech USB H570e USB headset of office looks like an unassuming unit. But it hides considerable comfort and quality audio. It is available in stereo and mono configurations. As a business product, this is priced affordably. So you won’t have to burn through your pockets just so that your employees can communicate. With the excellent sound quality, you can even swap these out for your music earphones. Logitech H570e definitely hit the home run in the best USB headsets for office debate. The Logitech USB H570e office headset looks really plain. Unremarkable as the design is, it perfectly fits into a corporate environment. It’s completely done in plain matte black and a small logo hides near the bottom of the headband. It has light padding in the cranial arch which sits softly on your head. The ear pieces both have doughnut-shaped padding. The headset is comfortable without being fragile. The headband is wider than the usual USB headsets in the market. The mic of this USB headset for office is rotated out for talking. It can rotate roughly 270° making the H570e side-independent. The end of the mic is slightly bent towards the speaker’s mouth. This way, it’s close enough to pick up your voice clearly but stays out of the way of drinks and food brought to the mouth. The single-sided cable is 6.9 feet long. The inline remote has four buttons. These are for volume up/down, Lync Call and Mute. The Call answer/end button and in-call LED are integrated with Lync and Cisco Jabber. Logitech directs that you download a driver from their website so that these functions will work with traditional Skype. Logitech H570e USB headset for office comes in two configurations: stereo and mono. The stereo brings double-sided audio and blocks out the office noise from around you. The mono headset keeps the audio to one ear and leaves the other side open so that you can keep an ear on your desk phone. Call clarity is exceptional for price on both headsets. You will hear no cable noise or crackle during the calls. It’s also good for music. It has good bass compared to most office headsets which sound tinny with a focus on midrange. The mic has noise-cancelling property which filters out the ambient noise during calls. Your voice is relayed clearly to the caller. 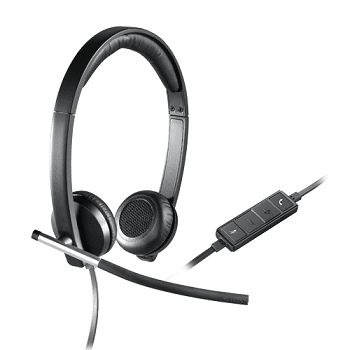 Sennheiser Culture Series Wideband USB headset for office is an ultra-lightweight unit for everyday work. It makes use of minimum padding and lightweight plastic to build a sturdy headphone. The form is minimalistic but highly sophisticated in terms of audio quality, both from the ear pieces and mic. The flexible mic can be arranged to pick up the voice as clearly as possible without burning a hole through your pocket. It is as good as the best USB headsets for office get. The Sennheiser Cultures Series office headset is an uber-light unit. It has a very slim headband. There’s no padding here but it’s lightweight enough to be comfortable. Both sides are extendable. The earcups are small. They are mounted with light sponge. They are by no means plush but they offset the weight of the headphone well. The mic is connected to a rotating arm. It is also quite flexible and rotates 270° too. So you can swap the ear pieces. The left earcup of this USB headset for office is connected to the cable with reinforced piping. The cable looks thin but it is hardy. The 6.5-feet cable ends in a compact USB plug. The inline control is slim and has the volume up/down buttons in a different color. This way you can quickly change volume. The other buttons are for mute and call answer. The last button can also be used for redialing the last call or rejecting a call on Skype. The call quality with Sennheiser Culture series was exceptional for the price. The voices are naturally conveyed, they are not sculpted digitally like in many hi-end headsets. The casual listener will like the balanced tone for music as well. SC60 uses ActiveGard technology to protect your ears against sudden surges in volume. It is also available in a mono model called SC30. The mic functionality has been lauded by many people disappointed by their Bluetooth headset. Even over regular internet speeds, the calls sound as clear as telephone calls. The noise-cancelling technology clears the background clutter and allows your voice to pass through unhindered. 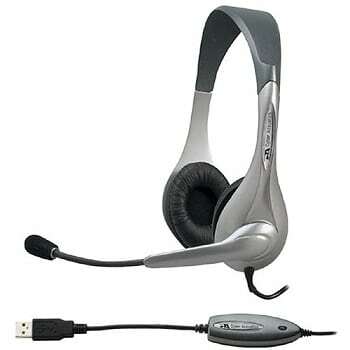 Plantronics PLNAUDIO478 USB headset for office has been around the market for ages. But it has given so many customers such a smooth ride that we couldn’t help but put it on the best Plantronics headsets for office list. Lightweight and highly portable, this headset brings excellent sound quality at a shoestring budget. That, along with the comfort of wearing them for long hours makes them an all-time favorite. The Plantronics 478 office headset is one of those rickety-looking units. But it is quite durable too. The tubular headband flattens down to a more agreeable shape over your head. The ear pieces are covered with flat pieces of sponge cushions. It’s very comfortable for the head and relatively airy too. But you should take it off on periodic basis. The arms of the headset fold and reduce it to the size of a pair of sunglasses. It is accompanied by soft cloth cover. A hard cover would have been much-suited for it but at its price we are not surprised. The cable of this USB headset for office connects to both the ear pieces. The cable is around 6 feet long. The USB plug is moderately built. The inline remote has four buttons, two for volume up/down, one for mute and last for Call answer/reject. The last two buttons are optimized for Lync but they don’t seem to work with the new version Skype for Business. The headset is Skype-certified and integrated properly with traditional Skype. The audio quality of Plantronics 478 USB headset for office keeps it afloat in the market. It is an excellent professional tool. Whether it’s for all-day call center calls or for picking up a new language online, the 478 is very efficient. The mic has a noise-cancelling technology which removes any traces of ambient noise or other office chatter. The headset uses some Digital Signal Processing to clear the static and pop out of the audio. The audio quality is also good for listening to music. A casual listener need not change back to normal earphones during office hours just for music. Plantronics Audio 995 is not a wired USB headset but it requires a USB port either way. It is wireless headset which connects to the USB dongle connected to your PC/laptop over thin air. This looks like a mix between gaming and office headset. It cooler than the corporate headsets but it’s not too cool for a workplace. The wireless connectivity also gives you more range of movement also. 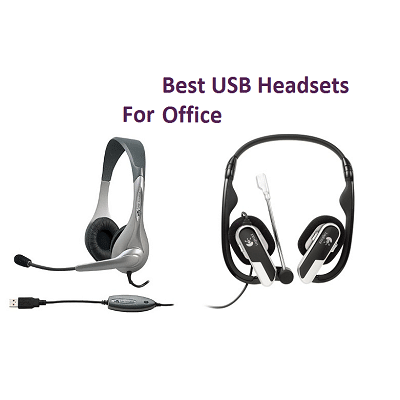 It is an exciting entry for the best USB headsets for office list. Plantronics Audio 995 USB headset for office is a cool gadget to have. It makes work feel like play. It is built like a gaming headset. The ear pieces are large and trapezoid. The headband is broad and padded on the underside. The padding on the ear pieces are sheathed in leatherette. 995 is comfortable for people of all head sizes. The mic retracts back into the left earcup. It cannot rotate backwards, so it’s not side-independent. The left earcup has four buttons. These are for volume navigation and track navigation. There’s no mute button for the mic. But it has an ingenious muting mechanism. When the mic is folded into the earcup, it automatically mutes. The center of the control pad is an LED. This intimates the user of the connection status. The USB dongle automatically pairs with the headset, so you barely get any lag in setup here. The battery lasts through an entire 10-hour work day. Our only complaint is that you cannot use the headset while it’s charging. And the battery is not replaceable. So you are effectively cut off during this period of hibernation. The Plantronics Audio 995 office headset uses a 2.45 GHz USB receiver. You can use two of these in close vicinity and you won’t face any crosstalk. The connection between the transmitter and receiver is very strong. The wireless connection does not drop like you would expect from a wireless set. The mic is highly sensitive. It will collect the vocals all the while cancelling noise from the office arena. It can be easily used with Dragon NaturallySpeaking or Rosetta Stone. 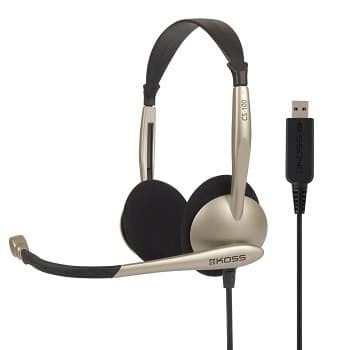 The Koss Communication USB headset for office is for the people on a shoestring budget. This is a polished-looking set but it feels a little plasticky. If you are careful with handling it, you can extend its life too. It is available in both 3.5mm and USB model. The lack of an inline remote might not be an issue for people who use keyboard controls. The audio quality has kept it in the market for more than a decade. This has been one of the best USB headsets for office for a long time. 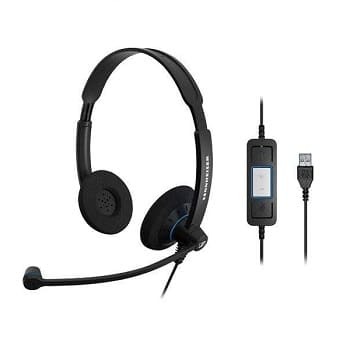 The Koss Communications office headset is a lightweight accessory for the work place. Done up in black and gold, it is an eye candy. The muted gold color is all over the sides of the headband and the ear pieces. The headband is tubular and flattens down at the cranial arch. The earcups have large pieces of sponge padding. They are well-ventilated and enough to uphold the minimal weight of the headset. The unit is done in plastic, so you must be careful while handling it. At its price, with proper handling, it would be a great investment. The cable that connects to one ear piece of this USB headset for office is approximately 9 feet long. There is no inline control and some people may resent the fact. But personally, we use the keyboard or the program controls most often. So it might not be an issue. The cable either ends in a 3.5mm double jack or a USB jack based on the model you choose. The 3.5mm model costs a few bucks less. The mic is mounted on a rotating arm with the mic turned towards the mouth. The Koss Communication office headset is an excellent set audio-wise. The audio has the vocal range that easily relays other voices on the call. Even the mumbler sounds clear. The bass has a rumbling presence, so you can use this for gaming. You get decent amount of details for the FPS games. The mic is pretty good at isolating voice and recording them for speech recognition modules. It has a success rate of around 90% or more. The noise reduction capability filters out the office rumble. 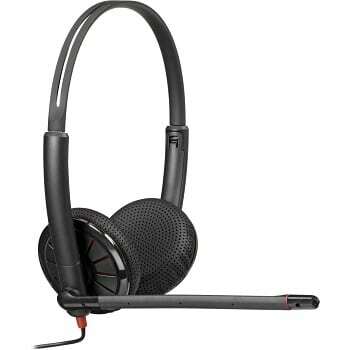 The Logitech H650e office headset is one of the pricier units in the list. The construction itself has some salient points which make them stand out above from the usual crowd. The form is sturdier than the usual affordable headsets. It comes in both stereo and mono configurations. It is integrated with the newest Skype for business which many of the older headsets do not support properly. Those are enough reasons to put it on the best USB headsets for office list. The Logitech H650e USB headset for office looks like a solid gadget. The headband is moderately broad. It has opulent cushioning in the cranial arch. The ear pieces are on-ear. They are equipped with plush pads with perforated center. These provide the much-needed ventilation for the long conference calls. The headset has an all-black profile. It will fit all head sizes well. But you need to take it off every couple of hours. The mic of this office headset is rotatable. It has a metal highlight which makes the whole unit look quite suave. It uses a 7-feet long flat cable connected to an inline control. The controls are for volume up/down, mute button and call answer/reject. The buttons are integrated with Lync and Cisco Jabber 9.6. The in-call LED at the back of the mic and call answer/end button do not work with the Skype or Cisco Jabber 9.2right away. The cable has a clip to keep it stable. The software plug-in may be activated by downloading it from the support pages on Logitech. This headset is available in single-earpiece model which allows you to monitor your desk phone while you are on call. The Logitech H650e office headset is one of the best units we used with the Skype for Business. It relayed voices noise-lessly through. The stereo version is much better than the mono in terms of hearing the calls. The mic is very sensitive. Even your breathe can successfully cause static in your voice. But you can adjust it vertically and deal with this issue. The voices on both sides of the call are clear as a bell, keeping in line with its premium price. The Executive Pro Overture USB headset for office makes a splash amongst the Logitech, Plantronics and Jabras. Lightweight and affordably-priced, it is perfect for someone who is all business and not into brand value and appearances. The comfort and audio quality are much better than many headsets in the same price range and comes with responsive customer care. It made into the best USB headsets for office list with no brand name backing it. At 2.6 ounces, the Executive Pro Overture Premium office headset is extremely lightweight. It is very slim and we haven’t heard any durability issues yet. The earcups are mounted onto the headband. The ear pieces swivel in their compartment. This allows them to angle according to your ears. These have been reported to be comfortable for people of all head sizes. The padding on the ear pieces has a leatherette coating which feels soft on the ears. The mic of this USB headset for office is mounted on a flexible boom. The mic tip is covered with a dust cover. It can rotate up and out of the way when not in use. The cable connects to only one ear. It runs 6.5 feet to terminate in a USB plug. The inline control is quite simple with these buttons and an LED. The former are for volume up/down and mute. The Executive Pro Overture Premium office headset has an impressive performance in the audio domain. The crystal clear call allows you to listen to the whole team, even those who are far from the VoIP. There’s no static, no crackle from being seated near other speakers or electronic devices. You can even play music on this headset. It doesn’t sound tinny or muddy. The sound signature is quite natural. The mic is suited for all business and over-the-web communication purposes. Many users experience drastic improvements with dictation software. The Jabra UC Voice 550 MS Duo Office headset is a great-looking unit. It is beefier than the bare-bones headsets that we usually see. It’s more stylish and it can suffer through some abuse before it breaks down. It scores well in call quality, comfort and durability. There was no reason to keep it out of the best USB headsets for office list. 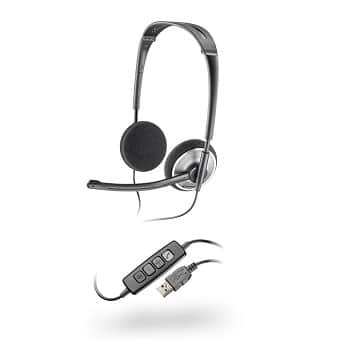 The Jabra UC Voice 550 MS Duo USB headset for office is black and metal design. The arch of the unit is completely padded and covered in synthetic leather. The joints where the headband extends has metal markings. The ear pieces are supra-aural. The doughnut-shaped cushions make it plenty comfortable for all sizes of heads. The mic of this office headset is mounted on a rotating arm. The mic extends from a flexible boom on this arm. The hardy cord attaches to one ear piece. It is around 6 feet long and has an inline control. This has a Mute button, volume up/down button and a call answer/reject. 550 MS is plug-and-play with most devices. You might need to select it as the default audio output. The audio signature of the Jabra UC 550 MS Duo office headset is carved out for relaying voices correctly. This is not a great headset for music. But the speech quality is excellent for the price. It uses PeakStop technology to curb any sudden splash in the volume and protect your hearing. The mic is just as clear over the call as the ear pieces. With VoIP softphone, you get call clarity. Many of the users on other end were surprised by the depth and details of the mic. The Plantronics Blackwire USB headset for office has a design remnant of the C325 set. This one is more affordable and a better choice for people who prefer sponge earpads to leather earpads. It ranks high in comfort because of its light weight. Seamless functionality and LED indicator lights make it a perfect professional accessory. 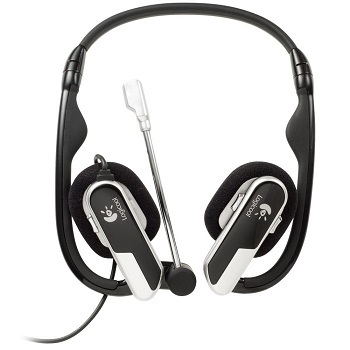 It is a hassle-free choice for the best USB headsets for office list. The Plantronics Blackwire office headset looks and feels light. The headband is slim and flattens out at the cranial arch. This area is slotted so the top of your head remains ventilated. The ear pieces have slots in the pattern of spokes just like the C-325. The earpads are sponge doughnuts. This is light and airy for an everyday user. The mic rotates forward when you need it and slides out of the way when not in use. It is comfortable for most head sizes. But people who are not comfortable with sponge padding might like the C-325 better. The cable of this USB headset for office connects to the left ear piece. The 6-feet long cable ends in a hardy USB plug. The inline control has four buttons, one each for volume up/down, mute button and a call answer/reject button. Indicator lights and vocal alerts tell you when the call is muted and volume information. The bendy boom of the Plantronics Blackwire office headset makes its mic very isolated from noise around you. The noise-cancelling effect will take the edge off any office chatter behind you. The calls made from this headset are very clear on the other end. The same goes for calls taken on it. There’s no distortion or sudden noises during the call. The connection is very stable. 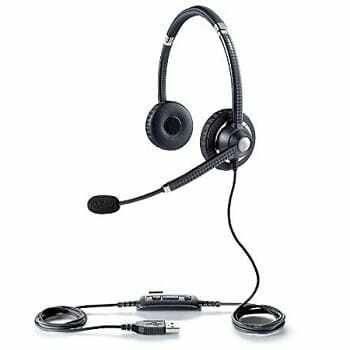 Cyber Acoustic AC-850 office headset is another one of the beefier units. Not only is it good-looking, it plays great audio too. Instead of the regular circular ear pieces, it steps into the realm of oval earcups. It is very affordable and performs decently at the price. It is available in both stereo and mono sets. This is a sure shot pick for the best USB headsets for office list. The Cyber Acoustics USB headset for office has a lovely design, a detour from the usual colors and forms. The headband is broader than the usual but it’s not padded. Given the light weight of the unit, the padding is not needed. The arms of the headband and the ear piece are done in muted silver. The earcups are oval and loaded with oval ear pads. They have leather sheathing. The mic is loaded on a movable arm on the left earcup and moves in 180° arc. A bendable boom extended from the arm which allows you to move the mic closer to the mouth. The cable is connected to the left earcup and ends in an unassuming USB plug. The cable is around 6 feet long and has an inline control with mute button. The unidirectional mic of the Cyber Acoustics office headset makes sure that only the wearer’s voice is picked up and all lateral noises are ignored. Its noise-cancelling properties also translate to clear conversation and dictation. The unit sounds clear on the calls. We did not experience any drops in connection during call. It served as a trusty communication piece in important meetings. 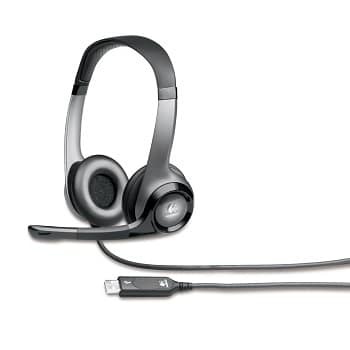 The Logitech H530 USB headset for office is a modern design for the smart crowd. Instead of going with the old, inline control concept, it provides on-ear controls. The architecture favors people with large flat heads who always find the conventional arches of headsets uncomfortable. Keeping such users in mind, H530 deserves a place in the best USB headsets for office list. Logitech H530 office headset has a solid architecture meant to survive the rough handling by professionals. The headband is wide and has minimal padding. Its arch is wide and fits flatter heads best. The ear pieces emerge from a springy base that is allows them to lean forward on the ears. The left ear piece has the control. The back side carries volume and mute buttons. The rim of the ear piece carries a mode button which equalizes the audio for call, music or gaming in a single touch. If you select the ‘Call’ mode, it will automatically route music to speakers while you take the call. The cable is heavy-duty and immune to damage from regular use. It is 8 feet long. This USB headset for office supports Super wideband audio for Skype 4.0 for windows or higher and Skype 2.8 for Mac or later. The mic rotates out on its arms when needed. It only reaches till the edge of your mouth. So you can drink or eat easily even when the mic is down. We were skeptical about the mic quality of H530 office headset because it wouldn’t reach all the way till the front of the mouth. But the mic vindicated itself against all these doubts. With dictation software, it picked up the details in our voice easily conveying our pronunciation correctly. The audio also has exceptional clarity when you receive calls from others. Even for music and gaming, we found this unit to perform agreeably well. Logitech H555, one of the best Logitech headphones and headsets, is a pricey but convenient set. Its behind-the-head headband makes it much more comfortable for long hours of use. This is a super wideband headset which cleans out internet calls of extra disturbances. The noise-cancelling mic and the elegant form earn it a place in the best USB headsets for office list. The main section of the Logitech H555 office headset has two sponge-mounted ear pieces. The back of these earcups carry the circuitry in USB-shaped construction. The headband arches back from the ear pieces and goes behind the head. The light pressure on ears is enough to keep the headband stable. The mic is attached on a pliable boom on the left ear piece. The headset is done in black and silver. The graceful contours match the price. The cable of the USB headset for office extends 6 feet long. The inline control has mute and volume buttons for immediate access to these functions. The super wideband audio for Logitech Vid, Skype 4.0 for Windows and later and Skype 2.8 for Mac or later is supported. It comes with a soft travel case for portability. The Logitech H555 office headset is especially noted for its audio. The super wideband audio makes the internet calls seamless. You get a decent jump compared to competition in terms of audio quality. The plug-and-play functionality makes it even easier to use on a daily basis. This headset is good for music playback as well. The mic works well for business, dictation, language learning tools etc..